FC Barcelona and NESTLÉ MILO agreed Thursday to develop a range of special activations based on our core value - Teamwork. By incorporating Tiki-Taka, the unique playing style of FC Barcelona, it is believed that profound energy and activeness will be injected into the programs and around 22.5 million MILO grassroots sports program children will be encouraged to stay active in a fun and healthy way. NESTLÉ MILO will fully utilize FC Barcelona’s well-developed youth training methodology and incorporate it into a smart football, the TIKI-TAKA BALL, which will enable grassroots program trainers to collect, monitor, and analyze performance data of their program participants with the ultimate hope of improving the children's performance. Both parties are deeply convinced that the perfect combination of the decades-long youth training methodology and stage-of-art technology will bring a real and fun experience to children and spread throughout the globe. Former player Eric Abidal and students from FCB Escola Singapore had a Tiki-Taka practice session prior to the event. They then performed a 3-on-3 match on the pitch during the press announcement, bringing excitement and joyful experience to the audience and the students. This echoed with the future activations with the hope to bring an active and healthy lifestyle to the future generation. The scale of activation will be worldwide focusing on APAC countries; it is expected to reach more than 22 million children under MILO grassroots programs along with other upcoming activations. MILO® is a tonic food beverage made from the natural goodness of malt, milk and cocoa. First launched in Australia in 1934 it is presently available in over 40 countries across the world. MILO is the worldwide leader in the Chocolate Malt Beverage powder market and is served over 36.3mio times daily (fortified serves). MILO® contains ACTIVGO, a combination of PROTOMALT®, vitamins and minerals, providing children with nutritious energy. MILO® has a history of over 50 years of MILO sports coaching programmes, promoting healthy, active lifestyle among children and believing that sports teaches positive values such as perseverance, teamwork, courage which sets the foundation for a child’s development. Annually, more than 22 million children are engaged in MILO grassroots sports development programs. “As the world’s largest food manufacturer, Nestlé is committed to making a difference in the lives of children across the world. By educating young people about the importance of sport and physical activity as part of a healthy lifestyle, we will build a better future for the next generation. Participating in sports and team activities is a great way for young people to learn the values of fairness, effort, respect and confidence. 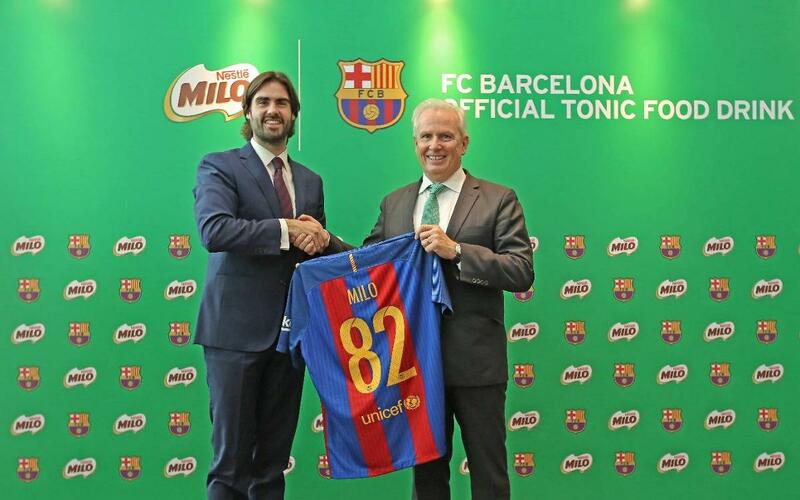 Building on these shared values, we are delighted to partner with FC Barcelona and develop a series of sports programs with our well-known MILO brand, designed to encourage more young people to take part in sport and enjoy a balanced diet. With this partnership, we aim to make a difference to lives of millions of children across the world”.